With yesterday’s NFL division championship games, I couldn’t resist giving a shout out to New Orleans Saints quarterback, Drew Brees, a fellow gluten-free eater. While Brees does not have celiac, he has an allergy to gluten and eats a diet free from wheat and gluten. (Brees discovered this allergy in 2004 as well as allergies to dairy and nuts.) Check out this 2007 Sports Illustrated article that discusses Brees’ workout regime as well as a typical day of gluten-free meals for the quarterback. In a Wall Street Journal interview last fall, Brees claims that he has much more energy due to his new diet and these changes allow him to sleep better and perform better on the athletic field. Clearly this professional athlete values making his body feel as good as possible because he relies on his energy and health in order to be successful at his job. 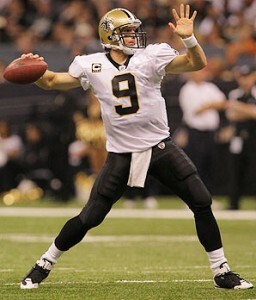 (Lots of people rely on Drew Brees feeling good and throwing well!) While we may not all be NFL stars, each of us needs to feel our best in order to engage in our own daily tasks. Hopefully Drew Brees will continue to feel energized and healthy as he continues to train for the Super Bowl in two weeks. Go Saints!